Mellany Msengezi Mariri | How to use technology to magnify your potential. How to use technology to magnify your potential. On Saturday I went out to do one or two errands with my children. One insisted on carrying a tablet ‘just in case’ of boredom they said. I gave my usual warning to them about using it in the wrong environment but they still took it. In less than five minutes after leaving the house he started using it. I decided to let it go. However, as we drove about myself and rest of people in the car were conversing on various topics and once in a while my other son would point at something as we zoomed past, like ‘look at that bike’. By the time Mr Tablet raised his head, he would be too late to see, understand or experience. He would then try to solicit descriptions from us and my job was to remind him that it is because of that distraction he was holding. Technology has rapidly evolved in the past centuries and introduction of so many gadgets along with it. For those in business, technology has made running businesses a lot more efficient and communicating a lot more faster. They are so many benefits, however technology seems to be taking a lot away from personal human interaction, a very important part of life. At times we no longer notice the small daily miracles as we are glued on the screens of our gadgets. Sometimes a break from technology allows your mind to develop its own ideas, it allows you to realize your own potential without technological short cuts. My small challenge is before you google your next answer, try jotting down your ideas first about the topic and then proceed. Another challenge is in every meeting with someone, try keeping clear of social media and only pick up phone when it rings. Am sure it will be so much fun to try it. 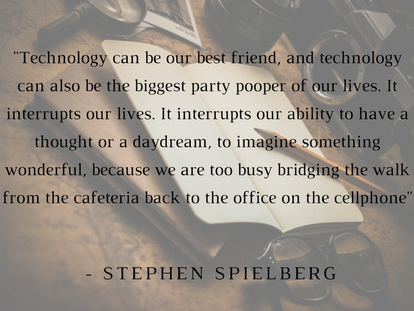 Remember that we have the capability to do so much of what technology enables us to do without it, but we just need to make sure that we use it to bring efficiencies and not rob us of quality personal engagements and relationships.